Flexible displays and flexible sensors will transform wearable technology by enabling devices to conform to our bodies and our clothes while offering greater utility. The market for wearable technology will reach $70 billion by 2025, with medical, fitness and wellness expected to be the dominant sectors, according to IDTechEx. The ability to make wearable technology ‘truly wearable’ is key to driving wide-spread sustainable adoption. Form factor constraints are an issue when it comes to design creativity and product utility. Most wearable devices are rigid and not sufficiently light or thin, making them uncomfortable to wear all the time. As well as being fragile, glass displays are often too small to add real value to the user’s experience. With the medicalisation of wearable technology, more and more wearable devices are being programmed to interact with our bodies and collect data that can be used to inform sport science and health research. Ensuring that these devices are shatterproof, unobtrusive and ‘unawareable’ will be important to succeed in designing healthcare applications. FlexEnable’s ground-breaking flexible electronics technology, which brings almost any surface to life, can help unlock the full potential of wearables. It enables true flexibility, bendability and unbreakability for displays, sensors and entire electronics systems on plastic – all of which are essential components for the design of wearable technology. 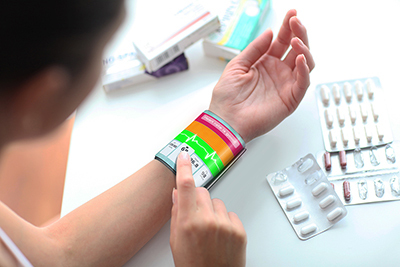 Flexible displays and sensors will ensure wearables are thin, light and robust, yet have a perfect form factor and are comfortable for the user. They will facilitate a great user experience and compatibility with the user’s lifestyle. Last, but not least, flexible electronics will unlock new creative designs and features. For strategic projects, we provide prototype OLCDs and driver electronics made in our prototyping line in Cambridge, UK.